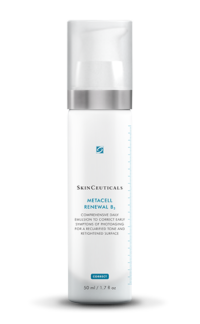 Announcing our April Product Special: get 20% off SkinCeuticals Metacell Renewal B3 lotion throughout the month! SkinCeuticals Metacell Renewal B3 is a lightweight lotion with vitamin B3 (niacinamide) designed to improve the appearance of early signs of aging. The lotion uses a patent-pending aqueous emulsion to deliver a high concentration of 5% niacinamide in combination with firming tripeptides and 15% pure glycerin to fight early signs of photoaging. Signs of photoaging look different for each individual, depending on skin biology, lifestyle, geography, sun protection behavior and skin care regimen. But generally, they create a prematurely-aged look. Metacell Renewal B3 visibly improves early signs of photoaging by boosting the creation of new, healthy cells to resurface skin, reclarifying and evening skin tone and improving the appearance of wrinkles and skin elasticity. Additionally, the lotion strengthens the skin’s moisture barrier, reduces the appearance of blotchiness and discoloration, delivers intense hydration without feeling heavy or sticky and helps make skin look more firm. Metacell Renewal B3 should be used twice daily, massaging 1-2 pumps into a thin, even layer onto the whole face, neck and chest. Using this regimen, in a 12 week study participants reported 15% improvement in skin radiance and luminosity, 20.9% improvement in the appearance of fine lines and 10.9% improvement in the appearance of firmness. Stop by one of our offices to purchase SkinCeuticals Metacell Renewal B3 at 20% discount! August & September Product Special: Revision Revox 7 In "Esthetician Blog"